From my Learn to Cook Series comes a homemade cream of celery soup recipe. Long before soup came out of a can people made their soups from scratch, and you will find this cream of celery soup recipe amazing. Best of all you can make a delicious pot of soup in about 25 minutes. As you may know I am working through my old home economics cookbook by cooking all of the recipes in my seventh-grade book. Who knew years ago that I would be a food blogger and I would be sharing recipes with everyone. If you enjoy these simple learn to cook videos be sure to check out the whole series Learn to Cook Series. There are a variety of recipes there for you. Today we are making a cream of celery soup recipe, and I can honestly say if you have never tried homemade cream of celery soup, it is amazing. The soup in a can is great to make recipes with, but I really think does not taste anything like a homemade cream of celery soup recipe. Homemade soups are so much better. This soup would make a great light lunch, or even a starter when you are cooking a meal. This version of cream of celery soup is a very simple version, it may be something like your grandmother would have made. I think cream of celery soup is perfect for when you have some celery left over and you don’t want it to go to waste. All it takes to make this homemade soup is celery, onion, flour, butter, milk, and a little salt. 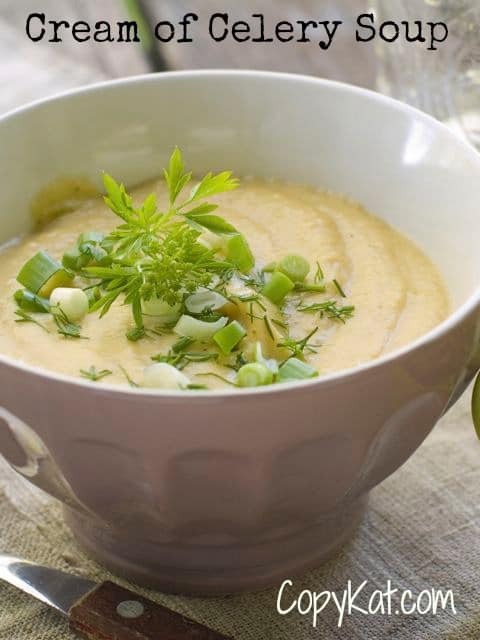 You can make great tasting cream of celery soup, move soup up from an ingredient to the main part of your meal. In a medium-sized saucepan over medium heat combine butter and chopped onion. Cook until onion becomes translucent. Add 1/4 teaspoon of salt to the onions when cooking them. Add 2 cups chopped celery to the onions and stir for a moment or two. Add 2 tablespoons of flour to the pot and cook for about a minute. Cook the flour until it becomes fragrant like pie crust. Add about 1/2 cup of milk to the pot and stir until the soup begins to thicken. Then add another 1/2 of milk and stir until the soup begins to thicken. Add the remaining milk in 1/2 cups increments until all of the milk is used. Turn the soup down to low, and simmer for about 15 minutes or until the celery becomes soft and tender. You may want to garnish the soup with some chopped celery, or even croutons when you are ready to serve. Simple, easy and delicious. My kind of recipe. I think it is better when it is not frozen. I have never tried making cream of celery soup but I bet I would love it! What is the first type of soup you ever made?